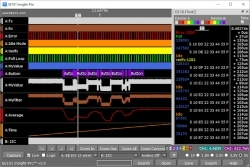 An EE101 Insight-Pro™ is a tool for analyzing today's embedded firmware systems and gives designers clear, concise insight into a designs operation so they can learn, investigate, debug and find and fix bugs quickly. Temecula, CA, February 16, 2018 --(PR.com)-- EE101, a company started by engineer and inventor Tim Harvey, recently released their new EE101 Insight-Pro™ Embedded System Analyzer. An EE101 Insight-Pro™ is a tool for analyzing today's embedded firmware systems and gives designers clear, concise insight into a designs operation so they can learn, investigate, debug and find and fix bugs quickly. It captures and displays logic analyzer digital data, oscilloscope analog data, current measurements, I2C, SPI and UART decoded data and the new EE101 firmware debug interface. The EE101 Insight-Pro™ presents firmware debug information in a new way that dramatically improves the debug cycle. It mixes the "printf" style debug statements with a mixed signal oscilloscope that shows detailed timing of real-time operation of the user's design. This gives access to data that is not contained on an external bus and shows the internal information that only embedded firmware knows. It automatically graphs internal firmware variables, such as acceleration, RSSI levels, battery charge and can log this data over days or weeks. "The Insight-Pro has replaced other USB based logic analyzers, oscilloscopes, and bus analyzers because none have our specialized firmware debug capability and can only sniff and decode busses that are external to the chips," says Harvey. "These other products leave the firmware designer bit counting and packet analyzing to extract information instead of looking at the direct answer." The EE101 Insight-Pro™ is sold on the company's website for $369 and ships within 24 hours. To learn more and to make a purchase, visit www.EE101.com. EE101 was formed in September 2016 by Tim Harvey in Temecula, California to develop innovative electronic test equipment in a small, compact design with powerful, yet easy to use, application software. For more information, visit www.EE101.com.